In this post I am going to tell you a bit more for the Office 365 Demo Tenants available for Microsoft Partners. This is not something new, but I think it is very useful and not popular enough. Last week I needed to do a SharePoint Online demo, this is not my primary work so I was not not prepared with any Office 365 demo tenant and content, so this came up very useful. If your company is Microsoft Partner and your Live account is associated with your company you can take advantage of the free Office 365 demo tenant for 90 days in order to do your shiny Office demos. This will include the full Office 365 stack, Exchange, Lync, SharePoint Online, Yammer, Power BI, demo content in order to demonstrate all the good things and 25 users. There is an option if you already have some spare Office 365 tenant to receive only the demo content, but I haven't tested this option. After the successful login you go to GET DEMO in order to provision a new Demo Tenant. 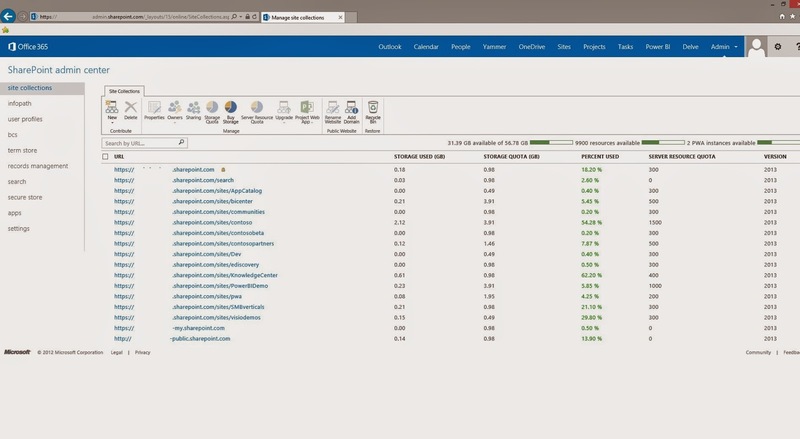 2 .Refresh a demo environment created with this tool - Do not expect this option to refresh your expired demo tenant after 90 days. If a demo tenant reaches 90 days you need to create new one if you need it. The explanation under the link of this options is descriptive enough(never tested it). 3. 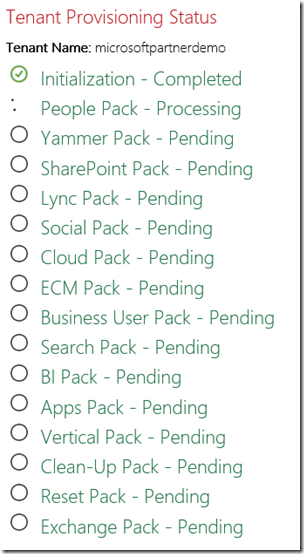 Just get demo content - I have my own O365 tenant! - As I said above this should provision only the Never tested this, because I do not have non-production O365 tenant where I can try it. 4. Create an empty Office 356 tenant - I guess that this will create you a Demo tenant without the content. If you you choose the 1 option, a new tenant with content, you will need to complete two more steps where you should specify the type of the content(Standard, Productivity Solution, Industry-Specific). At the second step you should specify the information for the tenant, like Tenant Name and your Sign-Up information(your mail, phone ...etc). The next thing you will have to do is to wait. You will be redirected to the below page where you can follow the deployment status of the different components. Be aware that if the provisioning process last for more than 48 hours there is a chance to be canceled and you will need to start all over again, you will receive regular status updates via email. You can also check the status in the Microsoft Office Demo site - CHECK DEMO. So if you need to prepare important demo/presentation do not leave this for the last moment. As I said above you will receive 25 demo users to play by the scripts provided in the Microsoft Office Demo site Resources. 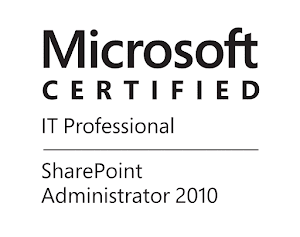 There will be scripts available somewhere in the SharePoint, in my case there were in https://<MyTenant>.sharepoint.com/Shared Documents/Forms/AllItems.aspx. Once the Demo is provisioned you will receive the Tenant Admin credentials and you are ready to explore and demonstrate Office 365 to your future customers. While you are deploying the Demo you will see the warning that you should not share credentials from this Demo with your customers! Please do not share them! Hi Sølve I noticed this too in the last couple of weeks. Fortunately above address is now redirecting to https://demos.microsoft.com/. It looks re branded and I am getting Application error when try to log in with partners account. I hope they fix it soon.